Which Exterior Shutter Color is Right for Your Home? 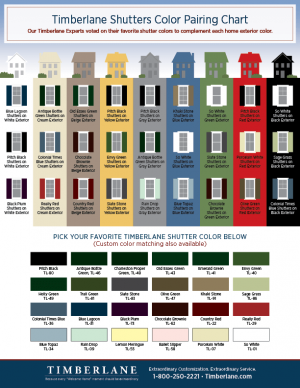 At Timberlane, we know shutter color is an important topic of conversation with our customers. Timberlane offers 24 Premium Paint colors as well as the opportunity to select any color they find! We will custom match any paint swatch, allowing our customers the fullest flexibility to express their unique tastes and styles. And with so many options, we often get the question: “What color is best suited for my home?” That’s why we asked our team of Tmberlane Experts to vote on which shutter colors were their favorite complements to nine common home exterior colors. 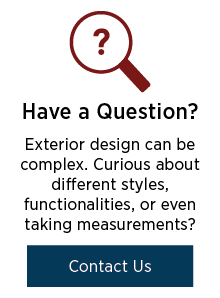 You can find the results by downloading the guide. If you’re still not sure, take a few minutes to talk to one of our Timberlane Experts about your home by calling us at 1-800-250-2221. 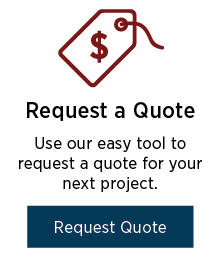 We’re here to make it easy, from picking the right color to finding the perfect shutter design. It’s just one more reason why customers tell us they are thrilled with our quality and service.